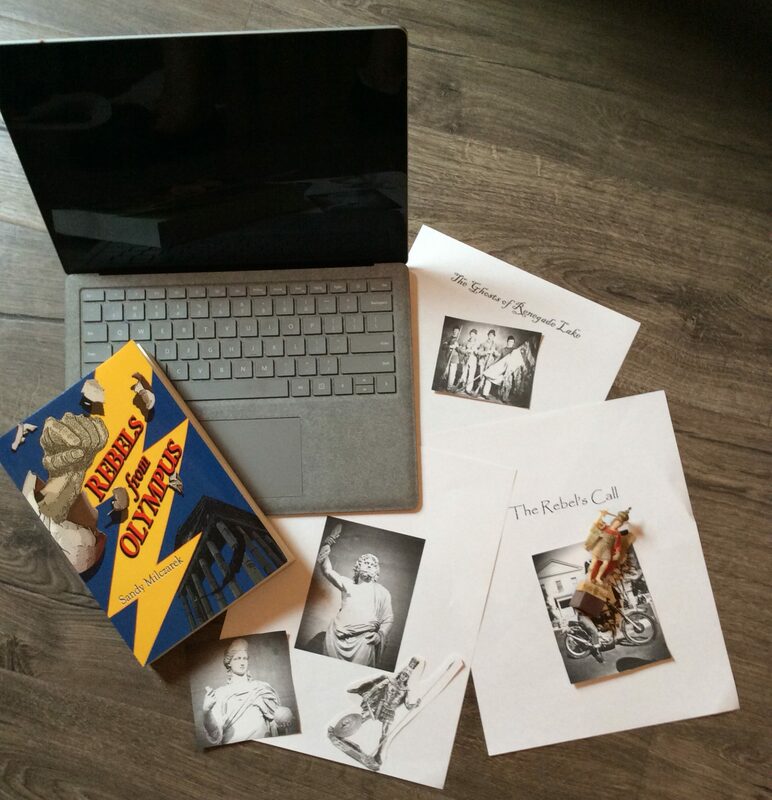 Did Plato write his “The Allegory of the Cave” while gazing in a crystal ball that foretold the future? How like a TV screen the cave wall seems in the above picture. Did the great philosopher have an inkling that modern man had the potential to become even more enslaved by projected images? If he wrote a current updated version of the allegory there would be no need of prisoners. After continued and increased exposure to entertainment century after century, we’re all easily held captive by the drama of adventure, love, suspense, horror, comedy, gossip projected on our screens. Ours is a more perfected, insidious version of Plato’s cave. I barely remember the whirl of names and schools of thought when we studied the ancient Greek philosophers in high school. But then? Plato’s Cave happened. That made me sit up and pay attention. It intrigued me like a mystery novel. 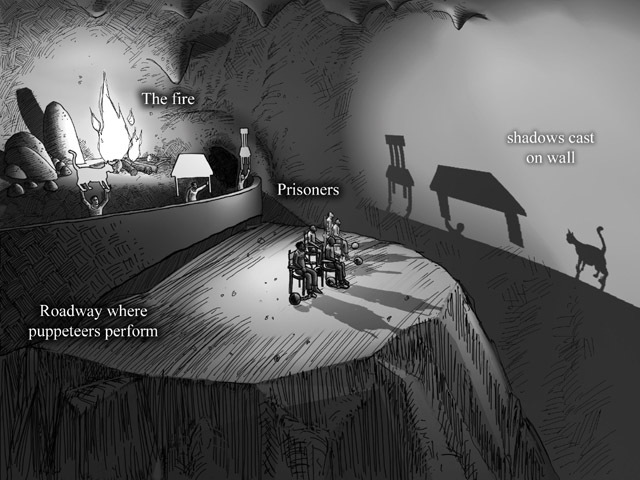 Bound prisoners are forced to watch shadow images projected on the cave wall in front of them. These images are created by concealed puppeteers who parade large puppets behind a bridge. A fire behind the puppets is what projects the shadows on the wall. This puppet show is the prisoners’ only narrow sense of reality. One of the prisoners escapes and crawls up a tunnel and enters into the true light of day. He’s astounded by what he sees – the sun, grass, trees, animals – nothing is like what he experienced in the shadows of the cave. He must go back and tell the others. Upon his return, he tries to explain what he saw, but no one wants to listen and go with him to see his new wonders. In the cave, they feel safe and unchallenged. Why stir things up? The questions I had. How and why were these prisoners held? What type of puppets were projected? Most importantly, who were the puppeteers hidden behind the bridge? What was their motivation? How were they slanting their version of reality for the prisoners? “The Allegory of the Cave” was written by Plato in a body of work titled Republic (512 a.d. – 520 a.d.). It was written as a dialogue between Plato’s brother, Glaucon, and his mentor, Socrates, who was also the narrator of the conversation. The cave allegory was to show the effect of education and the lack of it in human nature. Interesting. It’s not difficult to make contemporary comparisons with this allegory. One can start watching a movie on the home television, continue viewing on a cell phone or tablet while traveling, and finish up on a laptop. We love watching these projected shadows. It’s time to climb out of the dark cave together. We must question. Where is the Illusion? Where is the Delusion? Where is the Collusion?